Rwanda is changing the way public private health investments are done to benefit the poor. 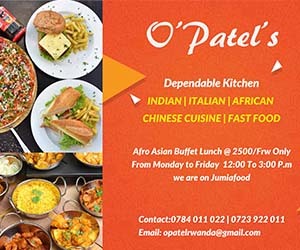 It is unusual for Medical Doctors to mobilise millions of dollars and invest in a multi-million dollar and bankable venture. In 2015, three big brains in global health, Drs. Paul Farmer, Peter Drobac, and Dr. Agnes Binagwaho; former health minister, mobilised funds for what turned out to be Rwanda’s biggest investment of the year. Equipped with an array of academic and extensive expertise from implementation experts to educators from leading academic medical institutions, including Harvard Medical School and Tufts University’s Cummings School of Veterinary Medicine, the doctors established the University of Global Health Equity (UGHE). The world-class health sciences university, owned by Partners in Health, an American health organisation, will be worth about $150million. Being built on top of the hill opposite to Mt. Muhabura in a country of a thousands hills is on track to become the new permanent home for the University. Emmanuel Kamanzi, Director of Campus Development, recently shared photographs on his Facebook page showing progress of the construction by the community in Burera District. Nearly 600 jobs are created since the beginning of construction, he says. “With thanks to the Government of Rwanda partners, the 63Km road is being paved; electricity is extended to the site,” Kamanzi said. While construction goes on, the first class of Master of Science in Global Health Delivery (MGHD) students graduated on May, 2017, yielding a new generation of health professionals equipped with the skills and endurance to tackle complex health care delivery challenges. In September 2015, after a highly selective admissions process, UGHE’s MGHD program welcomed 24 pioneering students from 12 countries eager to learn how to develop equitable, sustainable systems of care delivery. Over the last two years, members of the Class of 2017 have applied that same rigor to their studies. Students in the MGHD Class of 2017 remained employed as doctors, policy makers, veterinarians and more, as they attended the part-time program at a temporary campus in Kigali City where they learned how to manage challenges and resources. Can a rural center lead global health training? University will train a new generation of global health leaders from around the world. Shepley Bulfinch is overseeing academic building design, programming, and planning, with MASS in charge of landscape and housing. The landscape design makes ecological and agricultural functions legible across the campus so that students understand how various land uses affect space and ecology. Exterior circulation options encourage chance encounters while creating spaces for gathering at various scales. Around the Shepley-designed academic buildings, the landscape extends and amplifies each building’s academic program, with outdoor classrooms and staging areas for simulation. Five clusters of dormitories encourage communal living and learning at various scales. Each is formed around a communal landscape to foster stewardship and community within the campus. 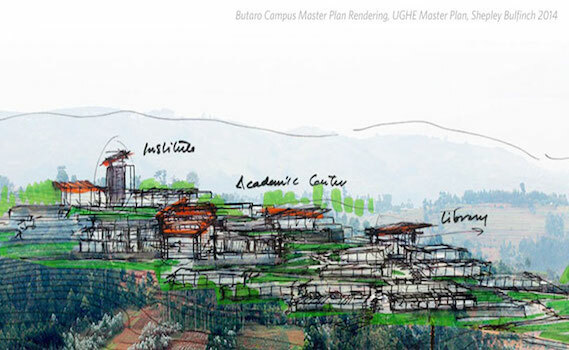 The clusters have a minimal footprint and step down the steep landscape so that the flatter sections of the hillside can be preserved for future development of larger academic buildings.